Have a quick question about your specific probate case? Enter your details below, and Robert will personally review and respond. Probate questions? We offer a free consultation. Trust Preparation – Avoid the high costs of Probate! Trust Review – There have been significant changes in the law! Trusts Administration – Are you the Trustee and not sure what to do? Questions about Wills & Trusts? We explain Wills, Trusts & Power of Attorney in simple language. Spanish and Tagalog translation is available. Finding the whole process overwhelming? 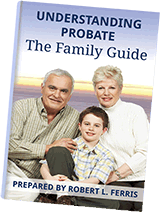 Let us help direct you with our family guide to understanding probate. Watch Robert on KRON 4. Copyright © Law Office of Robert L. Ferris. All Rights Reserved.